A hundred years from now, anyone who stumbles across Joe Henry’s liner notes essay from his album Civilians will be able to date it to the exact year, maybe even the very month in which he penned it. Oh, the references to government wire-tapping could be mistaken for some Orwellian flight of fantasy, and the essay’s title-”The Life You Save May Be Your Own,” nicked from a Flannery O’Connor short story-is a bit of a red herring, but make no mistake: If references to a shadowy, secretive war don’t give it away, the sly nod to America’s first Madame Speaker makes it clear. Joe Henry is writing from the only perspective he possibly can-he’s looking up the barrel of America circa 2007, and he’s wondering if this might very well be the end. Topical though his liner notes may be, I’m convinced that the songs they introduce will age much better. That’s the funny thing about America, the thing that U2 discovered when they set out to make an album about the hypocrisy that goes hand in hand with liberty, way back in 1987; that album was originally titled The Two Americas, but was redubbed The Joshua Tree when Bono and his crew wisely realized that wayward hearts and spiritual infidelity isn’t the stuff of Americans, but of human beings. 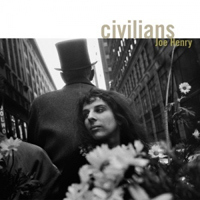 For his part, Joe Henry brings us Civilians, an album that captures the curious and terrifying malaise of the times in which we live better than any set of songs I’ve yet heard. To call this the sound of America in 2007, though, seems wrong-not because it’s an overstatement of the album’s power and importance so much as that it’s simply and utterly beside the point. These songs are about the human condition, in all its naked desire and boundless need. These are songs of a desperation so complete, only God’s enduring, awful grace can win the day. It’s the continuation of something he started on Tiny Voices. That album was all about jaded, self-deceiving lovers, living with the wild and dangerous love of the Divine all around them, but usually settling for something far less. On that album, truth was traded for comfort, real hope for something quick and easy, and God’s grace was something so totally foreign to us that the characters seldom seemed to know it when they saw it-and when they realized what it was, they hit the ground running in the complete opposite direction. It was an album about dangerous lovers in perilous times, looking into the abyss of their own making and seeking solace in the darkness. That’s not the only thing that’s different about Civilians. There are, of course, the tropes and trappings of the medium itself. Tiny Voices was an experiment in controlled chaos-musical anarchy that threatened to spiral out of control at any given second, but somehow managed to hold together for the entirety of its hour-plus duration. The chaos is subdued here, and the wind instruments gone completely, with Henry and his crack band aiming closer to the heart of the songs themselves-there are ghosts of everyone from Bob Dylan to Tom Waits here, and Henry carries with him some of the phrasing from his alt-country days and the spirit of improvisation that marked his jazzier albums. But as the dizzying Technicolor of the music has been scaled down, the scope of the songwriting has been blown up. The desperation of the times in which we live were blasting at Henry’s front door on the last album, and here his house has been blown away completely. The times have found him, and he has no choice but to confront them; “time is a lion,” he tells us, and our reckoning could be just around the corner, but time is also a dare, urging us on to see bigger and better things, to realize that the sublime moves all around us. “Civilians” opens the album with a tease, much like “This Afternoon” did on the last record, setting the tone by whispering ominous suggestions of something sinister at play without ever telling us exactly what’s going on. But as an undercover general maps out his battle plan from the comfort of a barstool, it becomes evident that the war being waged is being fought as much within as without. When we redefine torture and push mercy and compassion to the back of the room, it seems like the guns are being leveled against Truth itself, the one thing that can set us free being systematically phased out of our public life. “Progress rides with thieves and whores,” Henry sings on a later song, and one can’t help but wonder if even the meaning of freedom itself has become a bit blurry. But this isn’t an album about politics; it’s an album about people. “Parker’s Back” does for Charlie Parker what the opening song on Scar did for Richard Pryor, turning his life into a harrowing and beautiful account of addiction, finding in the most broken of men a vessel for the enduring grace of the Almighty. It’s no accident that this song appears on the same album as “Our Song,” a funeral dirge for a nation in decline that serves as the album’s centerpiece. It opens with a sighting of another American icon-Willie Mayes, this time-and mourns a people who have lost the plot and fallen into decay. Charlie Parker’s shadow looms over the song, begging the question: Is there grace for a civilization that’s falling apart at the seams? Can our self-destruction be turned into something beautiful? But it isn’t the beauty of words, or even the sanctity of romantic love that save us; it’s mercy alone. We can do “no more or less” than God will allow, Henry sings in the closing song, and even in our best efforts we are hanged by the storylines we write for ourselves; our love is “at war between all good intentions and greed,” uncertain, unsure, quick to escalate desire into addiction. What hope have we but to throw ourselves upon a grace that’s bigger than ourselves? The closing song, “God Only Knows,” is the most somber, but it, too, ends with a note of grace. Here all of the album’s themes and metaphors are tied together-when Henry sings of two giddy lovers passing by and laments that “we never were so young,” he’s singing about something bigger than just two people. It’s a song about the innocence we’ve lost-or perhaps, an innocence we never had, could never have. But, like “Our Song,” is frames desperation within the confines of Divine sovereignty. And, it ends, quite literally, with a prayer-”I’ll try to be your light in love/ And pray that it’s enough for now.” He repeats it over and over again, his voice fading and then rising again, clinging to the words like they’re a lifeboat. It’s a dark album, but dark is hardly the same thing as bleak. More than anything else, Joe Henry strikes me as a man marked by wisdom-and on Civilians, that wisdom manifest itself not just in cataloging what we’ve lost, but in affirming what we have left, clinging to it with a sober mind but a hopeful heart. And I’d put Henry’s own name on that second list; he’s one of our best songwriters and he’s at the peak of his powers here, making music that speaks to the time and place in which it was made better than any I can think of, but also strikes close to the heart of what it is to be human-be it in America, 2007, or not. Surely these are our songs-all of them-and we’re fortunate to have someone like Joe Henry singing them.